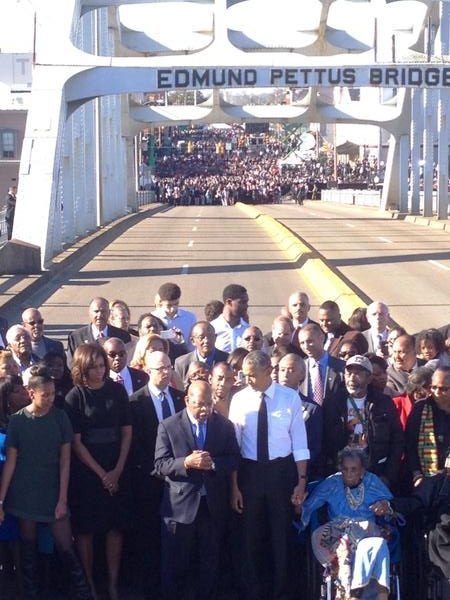 SELMA, AL–President Barack Obama stood before a crowd of thousands gathered in Selma on Saturday, March 7, to celebrate the 50th anniversary of Bloody Sunday. Buses traveled from across the nation including several groups from Louisiana to remember the famous march for justice and voting rights. Then, his knapsack stocked with an apple, a toothbrush, a book on government “all you need for a night behind bars,’ John Lewis led them out of the church on a mission to change America. There are places, and moments in America where this nation’s destiny has been decided. Many are sites of war â€“ Concord and Lexington, Appomattox and Gettysburg. Others are sites that symbolize the daring of America’s character Independence Hall and Seneca Falls, Kitty Hawk and Cape Canaveral. In one afternoon fifty years ago, so much of our turbulent history the stain of slavery and anguish of civil war; the yoke of segregation and tyranny of Jim Crow; the death of four little girls in Birmingham, and the dream of a Baptist preacher met on this bridge. And because of men and women like John Lewis, Joseph Lowery, Hosea Williams, Amelia Boynton, Diane Nash, Ralph Abernathy, C.T. Vivian, Andrew Young, Fred Shuttlesworth, Dr. King, and so many more, the idea of a just America, a fair America, an inclusive America, a generous America â€“ that idea ultimately triumphed. They did as Scripture instructed: ‘Rejoice in hope, be patient in tribulation, be constant in prayer’ And in the days to come, they went back again and again. When the trumpet call sounded for more to join, the people came “ black and white, young and old, Christian and Jew, waving the American flag and singing the same anthems full of faith and hope. A white newsman, Bill Plante, who covered the marches then and who is with us here today, quipped that the growing number of white people lowered the quality of the singing. To those who marched, though, those old gospel songs must have never sounded so sweet. What enormous faith these men and women had. Faith in God â€“ but also faith in America. The Americans who crossed this bridge were not physically imposing. But they gave courage to millions. They held no elected office. But they led a nation. They marched as Americans who had endured hundreds of years of brutal violence, and countless daily indignities â€“ but they didn’t seek special treatment, just the equal treatment promised to them almost a century before. As we commemorate their achievement, we are well-served to remember that at the time of the marches, many in power condemned rather than praised them. Back then, they were called Communists, half-breeds, outside agitators, sexual and moral degenerates, and worse â€“ everything but the name their parents gave them. Their faith was questioned. Their lives were threatened. Their patriotism was challenged. What could more profoundly vindicate the idea of America than plain and humble people â€“ the unsung, the downtrodden, the dreamers not of high station, not born to wealth or privilege, not of one religious tradition but many â€“ coming together to shape their country’s course? ‘We the People’ in order to form a more perfect union. Because of campaigns like this, a Voting Rights Act was passed. Political, economic, and social barriers came down, and the change these men and women wrought is visible here today in the presence of African Americans who run boardrooms, who sit on the bench, who serve in elected office from small towns to big cities; from the Congressional Black Caucus to the Oval Office. Because of what they did, the doors of opportunity swung open not just for African Americans, but for every American. Women marched through those doors. Latinos marched through those doors. Asian Americans, gay Americans, and Americans with disabilities came through those doors. Their endeavors gave the entire South the chance to rise again, not by reasserting the past, but by transcending the past. First and foremost, we have to recognize that one day’s commemoration, no matter how special, is not enough. If Selma taught us anything, it’s that our work is never done; the American experiment in self-government gives work and purpose to each generation. We do a disservice to the cause of justice by intimating that bias and discrimination are immutable, or that racial division is inherent to America. If you think nothing’s changed in the past fifty years, ask somebody who lived through the Selma or Chicago or L.A. of the Fifties. Ask the female CEO who once might have been assigned to the secretarial pool if nothing’s changed. Ask your gay friend if it’s easier to be out and proud in America now than it was thirty years ago. To deny this progress–our progress–would be to rob us of our own agency; our responsibility to do what we can to make America better. Of course, a more common mistake is to suggest that racism is banished, that the work that drew men and women to Selma is complete, and that whatever racial tensions remain are a consequence of those seeking to play the race card for their own purposes. We don’t need the Ferguson report to know that’s not true. We just need to open our eyes, and ears, and hearts, to know that this nation’s racial history still casts its long shadow upon us. We know the march is not yet over, the race is not yet won, and that reaching that blessed destination where we are judged by the content of our character requires admitting as much. We are capable of bearing a great burden, James Baldwin wrote, once we discover that the burden is reality and arrive where reality is. With such effort, we can make sure our criminal justice system serves all and not just some. Together, we can raise the level of mutual trust that policing is built on â€“ the idea that police officers are members of the communities they risk their lives to protect, and citizens in Ferguson and New York and Cleveland just want the same thing young people here marched for â€“ the protection of the law. Together, we can address unfair sentencing, and overcrowded prisons, and the stunted circumstances that rob too many boys of the chance to become men, and rob the nation of too many men who could be good dads, and workers, and neighbors. And with effort, we can protect the foundation stone of our democracy for which so many marched across this bridge â€“ and that is the right to vote. Right now, in 2015, fifty years after Selma, there are laws across this country designed to make it harder for people to vote. As we speak, more of such laws are being proposed. Meanwhile, the Voting Rights Act, the culmination of so much blood and sweat and tears, the product of so much sacrifice in the face of wanton violence, stands weakened, its future subject to partisan rancor. We are Lewis and Clark and Sacajawea â€“ pioneers who braved the unfamiliar, followed by a stampede of farmers and miners, entrepreneurs and hucksters. That’s our spirit. We’re the immigrants who stowed away on ships to reach these shores, the huddled masses yearning to breathe free â€“ Holocaust survivors, Soviet defectors, the Lost Boys of Sudan. We are the hopeful strivers who cross the Rio Grande because they want their kids to know a better life. That’s how we came to be. We are the people Langston Hughes wrote of, who build our temples for tomorrow, strong as we know how. We are the people Emerson wrote of, ‘who for truth and honor’s sake stand fast and suffer long;’ who are never tired, so long as we can see far enough. Because the single most powerful word in our democracy is the word ‘we’. We The People. We Shall Overcome. Yes We Can. It is owned by no one. It belongs to everyone. Oh, what a glorious task we are given, to continually try to improve this great nation of ours.